Being able to claim the head of household tax status makes a lot of sense if you are separated or divorced and have a dependent child still living at home. With this filing status, the standard deduction is higher and your tax rate will generally be lower as compared to filing jointly with your husband or as a single person. And for low-income single parents this can also result in a higher tax refund. Can I claim Head of Household? Your husband didn't live in your home for the last 6 months of the year for which the taxes are filed. You will not be filing a joint return with your spouse. You paid over half the cost of maintaining you home for that tax year. Your child lived in your home over half the year. Your child is considered a "qualifying child", meaning he or she has not turned 19 by the end of the tax year (and is not a full-time student), is younger than 24 at the end of the tax year (and considered a full-time student for at least 5 months during the tax year), or permanently disabled. 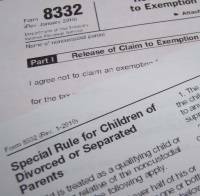 You are considered the custodial parent, even if your spouse will claim the dependency exemption via a signed Form 8332. The IRS is pretty specific in their definition of who is the custodial parent. To be classified as the custodial parent, your child must live with you more nights during the tax year than your ex. If you have recently separated or divorced, this test applies to the period after your spouse moved out. If the parents have a joint physical custody arrangement and the child lives with each parent an equal number of nights, the parent who has the highest adjusted gross income would be considered the custodial parent. In situations where one of the parents works nights, the parent who has the child living with them the most number of days is considered the custodial parent. Only one parent is allowed to claim the head of household status if all qualifying children reside with the custodial parent. In split custody situations, each parent has at least one child living with them the greater number of days out of the year. If each parent meets the requirements to file as head of household (as described above), both may do so if neither contributed to the support of the other household and separate finances were maintained. Can I file as head of household if I sign the form 8332? IRS Form 8332 allows the non-custodial parent to claim the dependent exemption and child tax credit for a qualifying child, but it doesn't change the filing status of the custodial parent. You will still be able to file your taxes as head of household, as well as claim the exclusion for dependent care benefits and the earned income credit if you qualify as the custodial parent (as described above). If your divorce agreement stipulates that you and your ex will alternate years being able to claim the exemption, it's a good idea to sign a new release (form 8332) every year your ex will be claiming the exemption. This way if your custody agreement is modified in the future, you won't have the hassle of trying to prove that you are entitled to claim the exemption. If by chance you did sign an extended release to allow your ex to claim the dependency exemption for your child, form 8332 also provides a section to allow you to revoke the release of claim for exemption. I strongly suggest reading more about the Head of Household tax filing status in IRS Publication 501 before filing your taxes. Should You Sign a Joint Tax Return during Divorce? Post Divorce Taxes - Who Qualifies for What?